Over the summer I set out trying to find a nice MiM Precision bass. For various boring reasons (e-bay and my own idiocy/awkwardness don't mix) I've ended up the mostly dissapointed owner of a bass I like some things about very much, but in other ways is a bit fucked. The biggest problem is a warped neck. I've tried straightening it but don't reckon it'll get any better than I've got it now (relief is 1.25mm at the 7th fret when capo'd at 1st and 20th). That's playable, but doesn't fill me with happy. Second problem is a knacked volume pot (as long as I leave it on full, stuff works). 1. Hope there's another mug as daft as me out there who'll pay near what I did (£400), problems and all, and go back to looking for a mex standard. I'm not comfortable with trying to pass it off as OK though, and don't think the market for basses with bad necks is exactly buoyant right now. So basically throw money away getting shot of it, and be back where I started. 2. Throw money away fixing the problems. At minimum this means a new neck and new volume pot, but it could also mean more significant changes... I'm not mad keen on "vintage custard" as a colour, particularly as there's a pea-sized ding in the poly by the jack socket. I'm leaning towards fixing it up, but what would you all do? 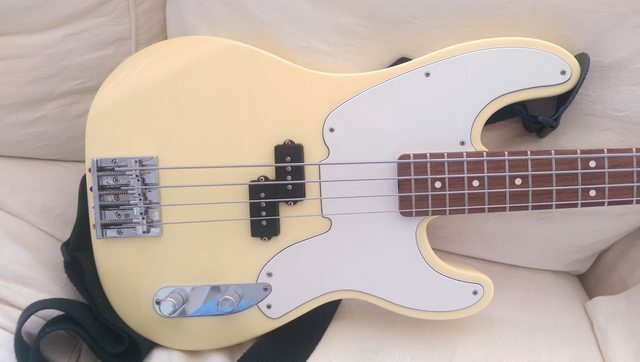 If you reckon "fix it up", I'd love to hear ideas of how to take this starting point to get to a cool bass (and an idea of how much it might cost). Question 1 - do you like how it actually sounds? There is a chance you won't need a new neck. 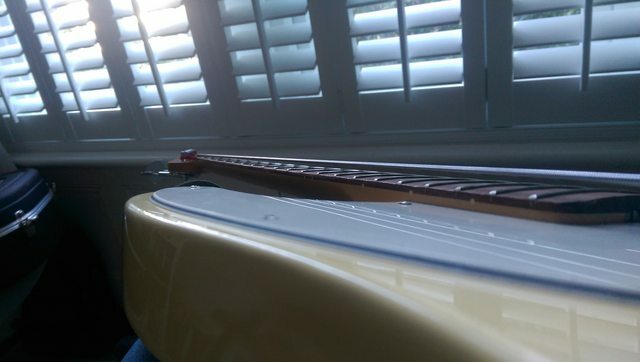 I had a MIJ P-bass with a chronic warp and the ever-reliable Andy Gibson shot the fingerboard beautifully and made it playable (he even saved me a few quid by replacing the original frets... not many guys will do that). If the weight of the bass is ok I'd think about fixing it up. Removing all that poly and doing a Truoil finish - as in the "stripped Baja Tele" thread - might look great. Very much. I wouldn't want to change the sound too much, just the playability. Oh, and the weight is around 9lbs, which I'm OK with (don't think it's too bad for a slab body). Oh, that's a nice looking bass. If possible get someone to have a look at it and cost up what it would take to get it right. Or you are selling it on as a 'project' and making a substantial loss. If you like the sound then I'd say it's worth a go fixing it. The pot is a very easy fix, the neck can be fixed, is it a twist I take it? The relief sounds fine, what is the problem? 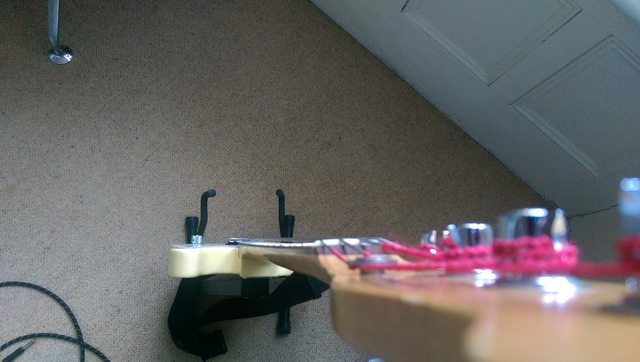 If the neck is just bowed and not twisted, are you sure the truss rod is as tight as it will go? They can sometimes be very stiff to turn, but they're nowhere near as fragile as often made out, and you can put a *lot* of force on them usually. If it seems really tight, clamp the body to a bench and deliberately back-bow the neck heavily by hand while tightening it - that will take a lot of tension off the rod and make it easier to turn. It may be worth taking the nut out and putting a little grease in the thread first. If it wont turn at all, it's possibly run out of thread - in which case it can be fixed very easily by putting a spacer under the nut. Sometimes a simple washer will work, but ideally you need something a bit thicker. If you can fix that, replacing the pot - possibly both of them, and the jack if it's not a Switchcraft, with better quality ones - is a piece of cake and then you'll have a really nice bass. Forget about the ding, it's just a ding. The only other thing I would maybe do is replace the guard - the bright white plastic looks a bit cheap. Black, pearl, tortoise or even just an aged white/parchment (depending on your taste) would all look much better. That's pretty much exactly what I've done. Took the truss nut out, left the neck clamped in a back bow for a couple of days, a bit of vaseline, a thick washer (filed down bike inner tube nut), tightened the truss rod hard as I could before releasing the clamps. Better than it was, to the point where it's straight with no strings but bows under tension. Might try repeating the process I guess. Replacing the pots and jack is something I could do (I have a long-suffering Squier Tele that's been soldered to death), though I might look around for a properly assembled loom this time. Pickguard off is another option, though that leaves a lot of yellow. A tortoiseshell pickguard will offset the body colour really nicely, and the contrast will probably make it look more off-white than yellow. Can you post pics of the neck bow under normal string tension? That's a challenge... this was the best I could do. Looks like you need either a shim in the neck pocket or lighter string gauges. That's definitely a neck bow problem not something shimming will fix. I don't know what the string gauges are but unless they're very heavy (like 50s) then going to a lighter gauger won't make enough difference, I don't think. Although they do look like flatwounds… are they? Some types of those are really high tension. If not and it won't straighten any more with what you can do with the truss rod, I agree that it's new neck time. Even planing it out probably won't work since it will leave the fingerboard too thin at the ends given how bad it looks. The strings are flatwound 45-105. If I slacken them off the bow is still noticeable - it doesn't really get to the kind of straightness I'd like until the strings are loose/off. I've mailed Marc at Mojo about a new wiring harness, which should fix the pot problem. I guess I need to decide whether to shell out for a Fender licensed neck. I'm thinking that whatever I do from this point it's pretty much going to be a partscaster so it seems wasted money for the name on the headstock, and I might as well go for whatever neck gives the best bang for the buck quality-wise? Is there any particular reason you'd want to fix this bass up vs looking for another functioning Precision? As noted fixing the pots isn't difficult/expensive. With the necks you can easily spend more than expected with replacing them - it's likely any cheap off the shelf neck will need the nut looking at, and possibly the frets too. So you can easily spend another £70+ on top of the purchase price just getting it to the point where it plays as well as it should. If you like the rest of the bass (it sounds like you do), I would get a replacement neck - it doesn't have to be a Fender. I'd take a bet that you can sell the old one too, even with full disclosure about the bow. There will be someone optimistic who wants to try fixing it themselves as a project, or who uses light strings and doesn't care about the action further up the neck. My concern would be that changing the neck will change the instrument. if you go close to like for like it might not be a big change, but it's unlikely to be like for like.